Blackjack dealt by a real dealer using real playing cards, but played online. Vision of the game is streamed live to your PC allowing you to play the game real-time. Almost all online casinos with live games offer blackjack, including those listed below. Do the games look very different at different casinos? Yes. 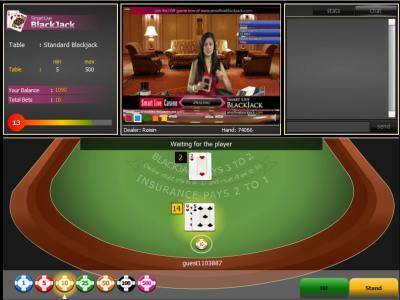 While in the main a game of live blackjack consists of a video stream inset in a bet interface, the appearance and features of the video and the surrounding interface differ substantially from one casino to the next. There’s a comprehensive comparison of a complete range of blackjack games at this live online blackjack site. The rules vary slightly from one casino to the next (dealer hit or stand on soft 17, re-split Aces allowed etc) but on the whole they are pretty similar. Another important aspect of a game of blackjack, the size of the shoe (ie how many decks are in the shoe), is also quite consistent across different casinos and platforms, with an 8 deck deal shuffled mid-shoe the common approach. The reason for the shuffle mid-shoe is to prevent deck penetration and preclude the possibility of an effective count (thwart advantage players). For a more detailed consideration of blackjack rules particular to the live online version of the game, visit livedealer.org’s live blackjack tutorial page. What types of live blackjack games are available? Multi-player live online blackjack: By far the most common version available – 7 seat multi-player table with each player hand played in turn, as would happen at a ‘bricks and mortar’ casino. The below screenshot is from Unibet. Single player live online blackjack: One deal, many players. A slightly changed deal convention allows many players to play the single blackjack deal. Not for the purists, but essential at casinos like Smart Live Casino which broadcasts its games on both free to air and pay television channels to UK players. 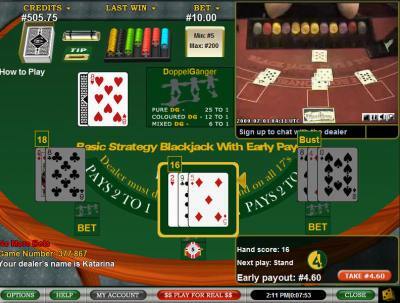 Basic Strategy with Early Payout: Playable from the tables within Dublin’s Fitzwilliam Casino, this game enforces basic strategy play and offers early surrender at various stages of the deal. Not for everyone. Screenshot below is from a game played at Dublinbet.